House intelligence committee members still have serious questions about his actions. On Wednesday afternoon, Rep. Devin Nunes (R-Calif.), the chair of the House intelligence committee, blew up the congressional intelligence oversight process. On Thursday morning, at a private committee meeting, he apologized to his colleagues. But, according to a committee source, Nunes would not say what he thought he had done wrong or explain his actions. Without consulting with the members of his committee—Republicans and Democrats—Nunes on Wednesday held two press conferences, during which he claimed he had been given information indicating that members of Donald Trump’s presidential transition team, including possibly Trump, were picked up during lawfully authorized intelligence surveillance of other targets and that their identities were disclosed in intelligence reporting based on these intercepts. Nunes also rushed to the White House to share this information with Trump. After the Thursday morning meeting, Rep. Jackie Speier (Calif.), one of the committee’s Democrats, told reporters that Nunes had apologized to committee members. 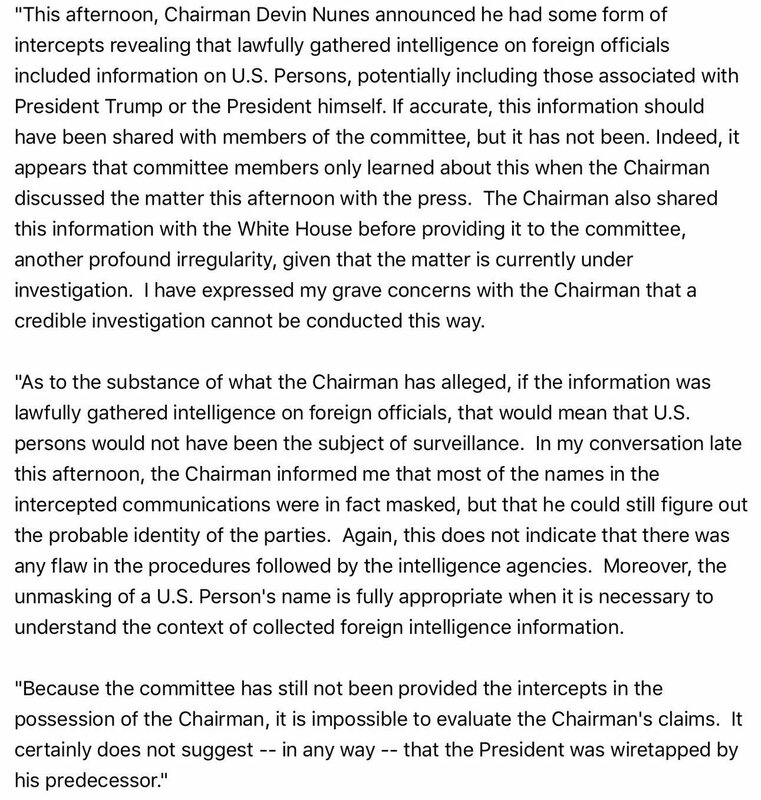 Another committee source confirms that Nunes did express his regrets but adds that Nunes would not tell committee members where the information he cited had come from. Nunes did promise, according to this source, that he would share the material with his colleagues on Friday. This is an important point. According to the committee source, Nunes did not tell his staffers about this information prior to his Wednesday press conferences. He went rogue. That would suggest that the information was given to him directly—which would be an unusual occurrence. In most cases involving an intelligence community official or employee bringing information to the committee, a staffer would handle the matter first. There has been widespread speculation among intelligence world observers that the White House may have sent the material Nunes’ way. So its origins could be a telling piece of information. Nunes’ disclosure on Wednesday created a major rift in a committee already racked with tension. After Nunes’ press conferences, Schiff declared that he had “grave concerns” and suggested Nunes was acting as a “surrogate for Trump.” He questioned whether Nunes could be a fair and independent manager of the Russia-Trump probe. “A credible investigation cannot be conducted this way,” he said in a statement. Nunes’ apology is not likely to heal the wounds he inflicted with his unprecedented move. He may have killed any chance there was for his committee to mount an effective and independent probe and bolstered the case for a special select committee or an independent commission. And he still has more explaining to do—to committee members and to the public.